The May 2009 Newsletter has been posted. Links to photo galleries and additional information mentioned in articles in this newsletter can be found there, too. > Check Zephyrs ‘new on the website‘ to find out if there have been changes in the May 2009 rally and also find out what else is new on the website. Rock music blaring from boomboxes has proved one of the best defenses against an annual invasion of Mormon crickets. The huge flightless insects are a fearsome sight as they advance across the desert in armies of millions that march over, under or into anything in their way. In flyspeck villages like Tuscarora, crickets are a serious matter. The critters hatch in April in the barren soil of northern Nevada, western Utah and other parts of the Great Basin, quickly growing into blood-red, ravenous insects more than 2 inches long. The crickets can make for hazardous driving, too. Cleaning them off the rigs can be a chore as well. Take care and take heed! If you’ve got some electronic stuff you’d rather not tote around in your RV, this Saturday May 2, 2009 is for you. First is the EmcommWest swap meet in Reno that runs from 7 to noon. Then there is the Reno E-Waste Recycling Event open from 9 to 2. The recycling event is looking for volunteers. They got a bit more of a response to their January effort so they want to be better prepared this time. So they are looking for 200 volunteers and are using the location on Plumb where the Old Park Lane Mall used to be. So if you can’t sell it, you can recycle it! The Shasta Cascade Wonderland Association is out for you to visit. 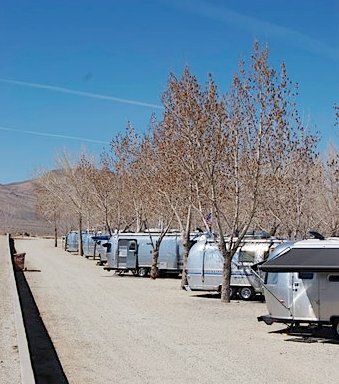 They even have a twitter page with lots of pictures of their Airstream out spreading the word about this part of northern California. Twitter is kinda’ like a weblog where each entry is 140 characters or less with a picture. Check it out! The Autoblog reports that MINI Cooper S Clubman joins Airstream Trailer. Together with Danish furniture designer, Republic of Fritz Hansen, the companies have created a concept Mini Cooper S Clubman coupled to a matching 22-foot Airstream trailer with a “down-by-the beach” feel. That toyhauler on this month’s Blue Beret opened up the rear. This one folds down the side to form a porch on a cabana. See the report and check out the photo gallery for some style that makes the practical person wonder about kitchens and bathrooms – and chair comfort. K9JY had a post a while back about Field Day preparation: Field Day Station Captain Checklist. That should give us something to think about for the Sweetwater Rally. In another post K9JY considers the goals of the event. In the SNU case, the goal of the Field Day Rally is more on the line of just seeing if we can get an operating station up for the weekend. We will be in one of the least active areas of the US for the event but the sun is at unheard of minimums so propagation won’t have that benefit. The road on the right is Pittville Road (NFS 111) that runs from Route 44 near Poison Lake up to Pittville on 299. It is gravel and the southern part is of unknown quality. You’d have about 30 miles of gravel road taking this route. The road on the left is the Cassel Fall River road (NFS 7R02) between Cassel off 89 and Fall River Mills off 299. Cinder Cone Road runs between these two but that road doesn’t appear on many maps (it and the Peterson Ranch are supposedly on the NFS Eldorado Forest Map). The suggested route for those coming from the south who aren’t enthused about 30 miles of gravel road of unknown quality would be to go to Fall River Mills and then south on Cassel Fall River Road to Cinder Cone. We’ll get GPS coordinates for pertinent points after the next scouting trip planned for later this month. The Friends of Washoe County Library will have their special sale April 24 – March 3. The next one is set for January 9 – 10, 2010. 5205 Mill St. at Edison in Reno. Books, video tapes, and DVD’s will be on sale, cheap. Check booksalefinder for hours. If you’re not near Reno, check out the site and maybe you’ll find a book sale near you. So, if you need some reading material but are budget constrained, check it out. The War on Short Yellows at the Wall Street Journal online takes a look at automated traffic tickets and what they are really about. The facts are well known but they seem to make no difference. When you, as a driver, are distracted by having to divert your attention from looking for traffic hazards to looking for hidden cops and traffic cameras, you are not driving as safely as you could be driving. The April 2009 Newsletter has been posted! Links to photo galleries and additional information mentioned in articles in this newsletter can be found there, too. The April Rally will be at Boca Rest Campground. The dates are Thursday April 23 to Sunday 26, 2009. Boca Rest is off I80 just East of Truckee. The campground is right off a paved road and sits right by Boca reservoir. There are pit toilets and water (which may or may not be turned on yet) We will be visible from the road so you can’t miss it. This may be our only chance for a nice campfire before fire restrictions so bring some wood. Camping fees for Boca are about $11 per night. See you at Boca! The ARRL PACIFICON 2009, the Pacific Division Convention, is getting together with Emcomwest at the Reno Circus Circus on May 1, 2, and 3. There will be a big swap meet as part of the convention. For more information check the Zephyrs link listed in this newsletter. > Check Zephyrs what’s new to find out if there have been changes in the March 2009 rally and also find out what else is new on the website. KOH reports that Washoe County won’t be sending out coupons to residents this year but will still allow free dumping of yard waste in late April at the main dump or the Reno transfer station. See the Keep Truckee Meadows Beautiful website for more on this program. Cook the Perfect Boiled Egg with the Power of Science has several links to resources to get it done. One is to a site where you can enter things like current egg temperature, altitude, egg circumference, and desired yolk hardness and it will start a timer for how long to keep the egg in boiling water. Also check out how to improve your egg-peeling skills and how to cook perfect scrambled eggs. And don’t forget safety. See the USDA or about.com or Alaska’s DEC. – don’t forget to follow the links on these pages, too. You’ll become an eggspert, first class! Metafilter has several links to the UNR Sheepherders of Northern Nevada multimedia exhibit. The comments provide additional related links. Arborglyph is the fancy name given to graffiti made in the bark of Aspen trees by Basque and Irish shepherds throughout the Pacific Northwest United States (wikipedia). It seems the sheepherders made more of these tree markings than any other group. jewelry, and much more!” There will be raffles with prizes going on all weekend. The Wouff Hong ceremony is planned for midnight, Saturday. That’s a special ARRL secret thing. Check the Emcomwest web site for the particulars.